I started this painting quite some time ago. I won’t tell you how long I have been procrastinating finishing this, other than my daughter’s hands and feet are much bigger than they would have been had I finished it when I started it. 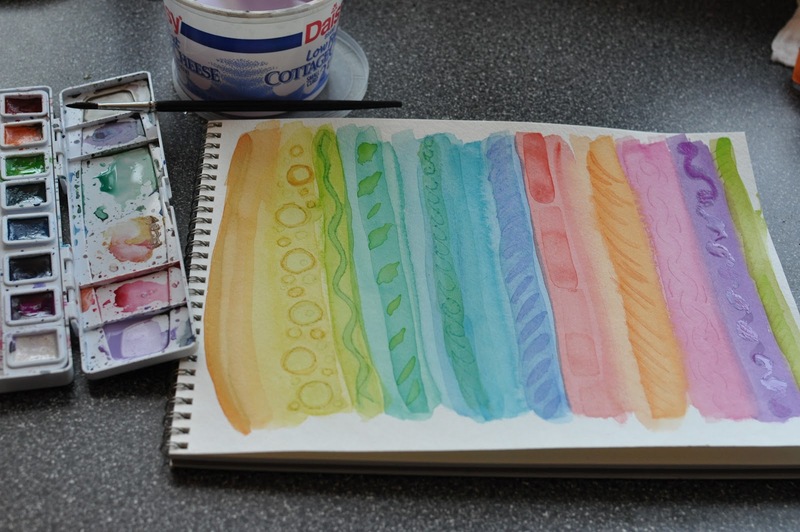 I started by painting simple abstract design using patterns of shapes and lines – nothing too fancy about this watercolor. I used watercolor paints for the background on a 140 lb cold press watercolor paper. I added in some etching by scratching into the wet paper and then painting over it. This creates areas of color much darker and more precisely defined because the pigment pools and dries in the etched lines. This photo above shows the orange lines and yellow dots are etched. When the paint dried completely (over a much longer time than I had planned), we stamped her little hand and foot. I needed Eric’s help holding her still while I applied the paint. I rolled black acrylic paint onto an old magazine (for a smooth surface) with a brayer, pressed her hand into the paint, and then pressed it onto the painting. 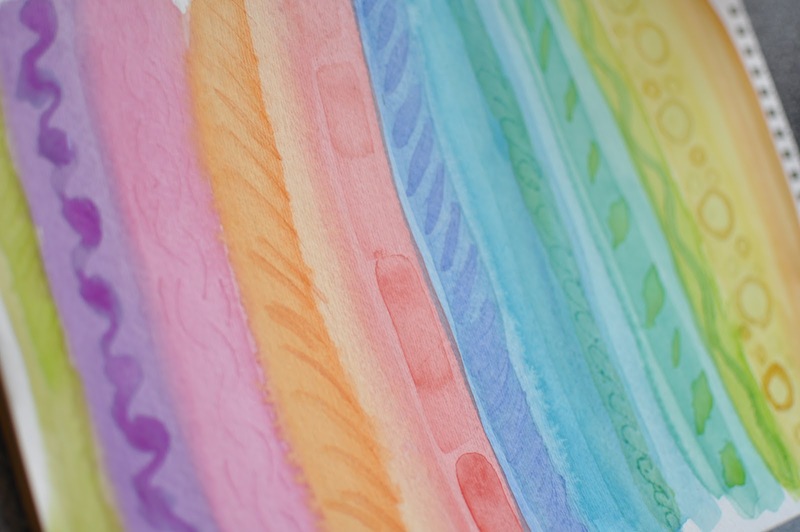 If you don’t have a brayer, you could also use a paint brush to smooth the paint surface out. She was so intrigued by the black stuff on her hand, she did not put up a struggle at all. 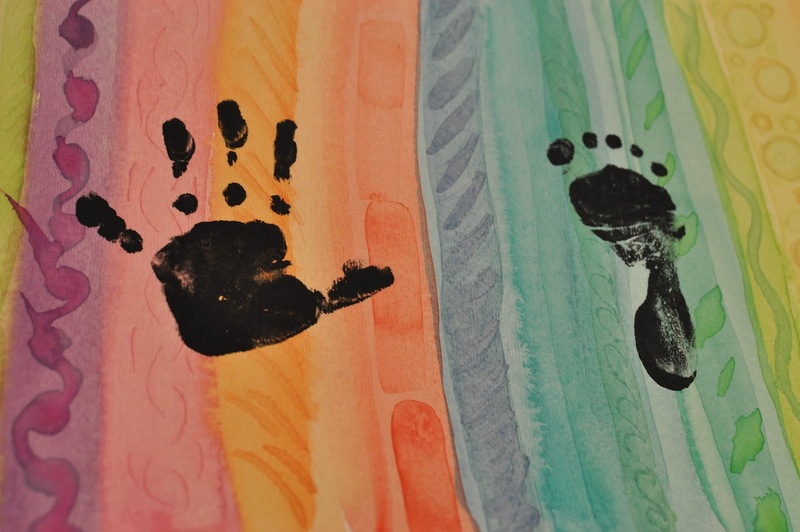 Make sure you have a wet rag or paper towels handy if you are going to paint your baby’s hands or feet! Now we just need to frame it and hang it somewhere where it will make me smile for years to come. 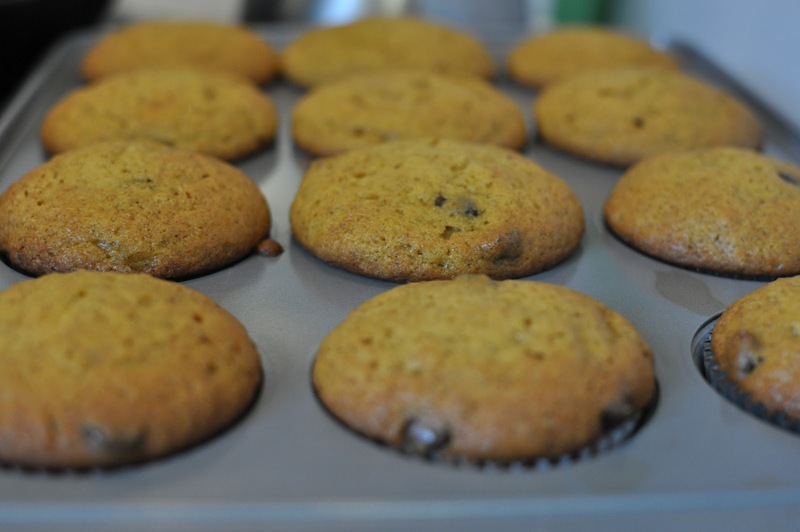 It’s Saturday afternoon, my daughter just goes down for her second nap of the day and I am struck with the urge to go up the street to the local coffee shop, Spring Garden Bakery for coffee and their delicious pumpkin chocolate chip muffins. What am I to do? 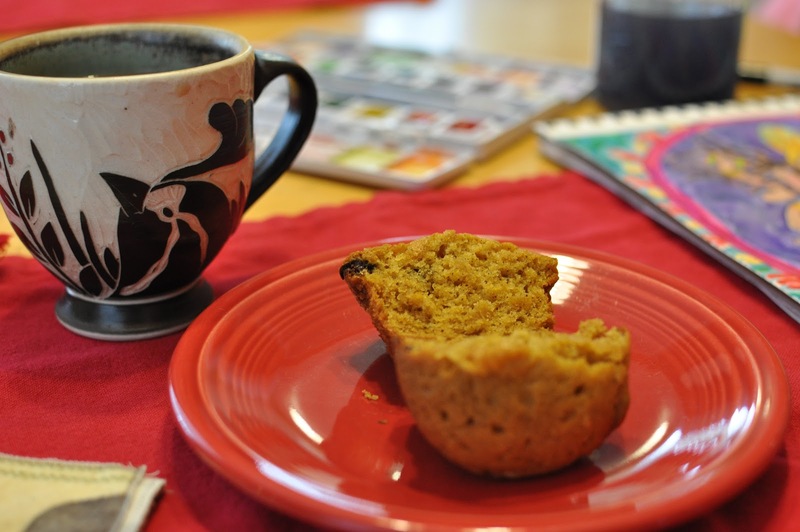 Make my own muffins and coffee and enjoy a half hour to paint and relax! More on that painting later this week. Preheat oven to 350 degree. 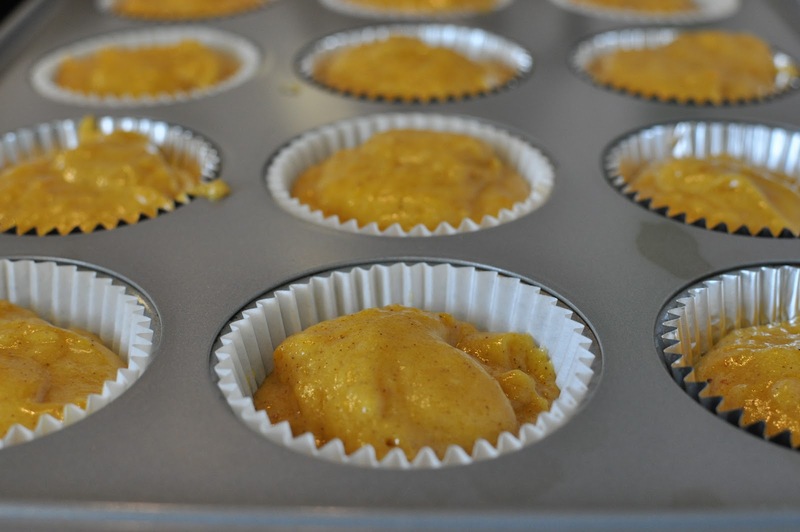 Prepare a standard 12-cup muffin pan with spray or paper liners. 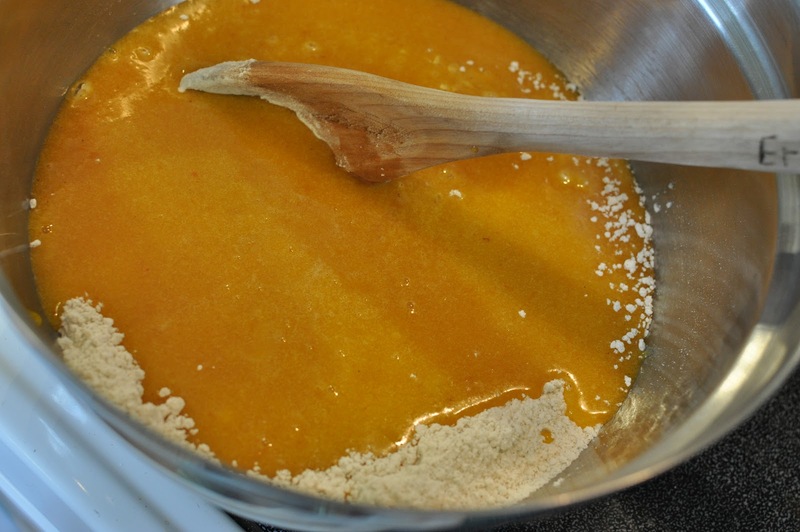 Whisk together sugar, pumpkin puree, eggs, and oil until smooth. 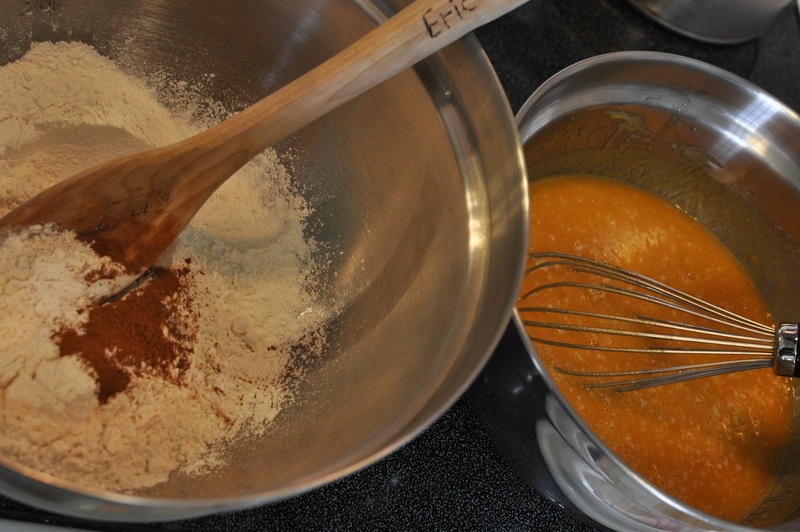 In another bowl, stir together flour, baking soda, baking powder, salt, cinnamon, cloves, and nutmeg. 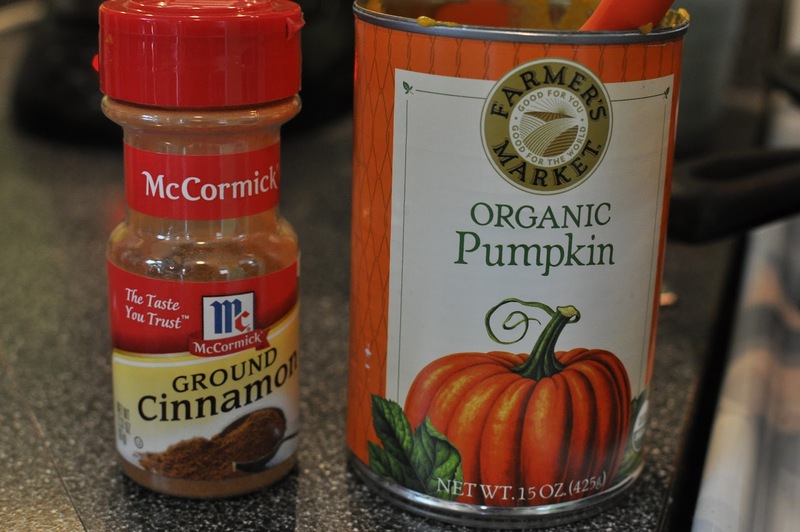 Add the dry ingredients to the pumpkin mixture and beat 1-2 minutes. The batter will be thick, do not over mix. Bake until top is browned and crusty, 20-25 minutes. Knife should come out clean. Transfer pan to wire rack and let cool for 10 minutes. Remove muffins from pan to cool completely. Two of my favorite flavors: cinnamon & pumpkin. Yes, I do keep cans of pumpkin on hand all year, it’s not just for autumn cooking! 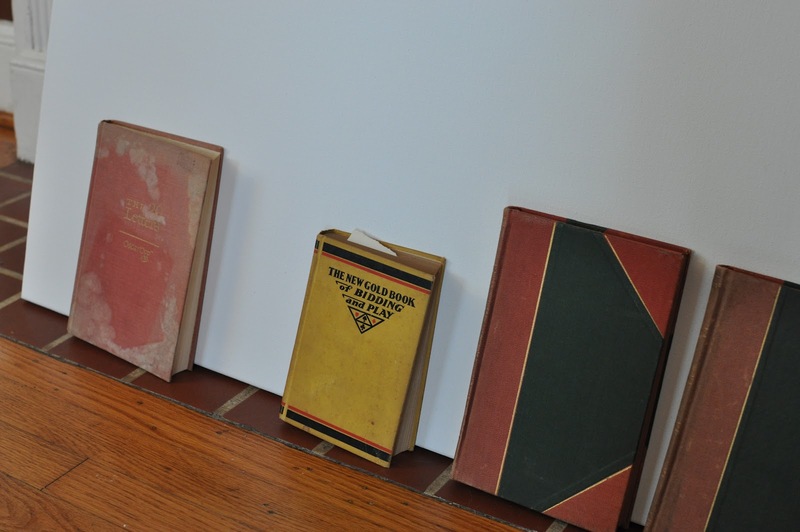 Part of me cringes at the thought of cutting up books and the other part of me loves the idea of turning an old yellowed hardcover with no hope of being read anytime soon into a work of art. My newest collage I have started is based on pages from old books. 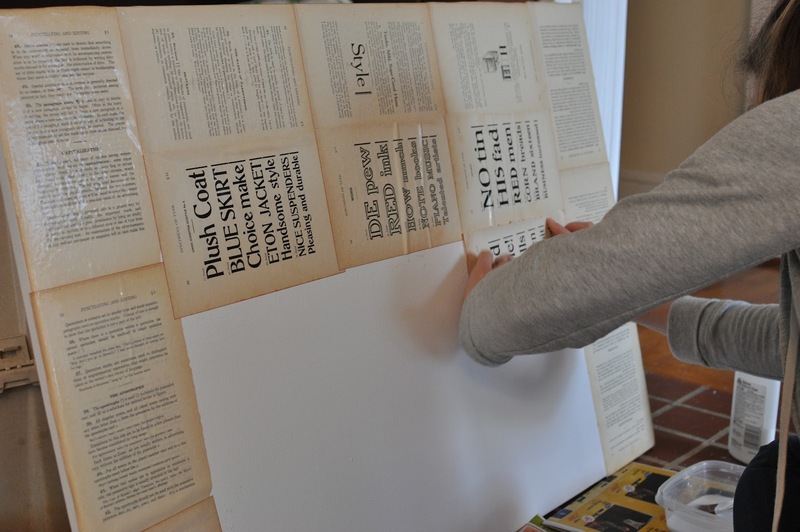 We visited the Green Hill Center for Art in downtown Greensboro last weekend to see the show Word Maps. It featured the artists Vicki Essig, Heather Gordon, Paul Rousso, and Merrill Shatzman. All of the works by these artists were inspiring to me, and I found the show to be such a surprising delight. 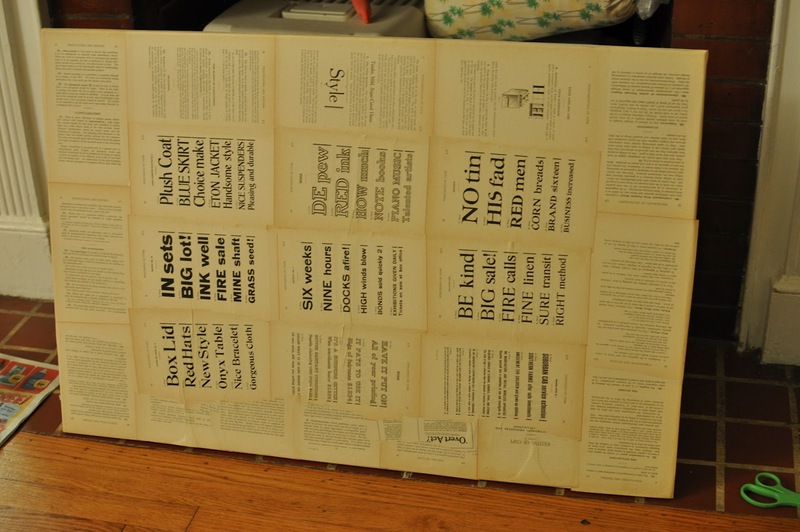 Paul Rousso’s work with collage was most interesting to me – his use of old books, comic pages, and newspaper was fascinating. The scale of his collages were formidable, however upon closer inspection you were able to start recognizing and picking out text and patches of color. Needless to say, I was inspired. On the way back to the car we stopped at a used book store and I picked up a few old hardcover books to start my newest collage adventure. Eric and I had bought a canvas a while back to use as a fireplace screen. We don’t actually have fires in our fireplace because it is the best current location for the litter boxes. The canvas does a very nice job of covering up and containing litter, but it was just begging to be clothed. I researched adhesives and methods for this collage before beginning and decided to try watering down white glue and brushing it on the book pages, then brushing it on again over the top of the pages. At first the entire canvas was a wrinkly mess – my best guess is that the canvas was wet and sagged a bit. Once it was dry it was smooth and leathery to the tough. This is only layer one. I plan on adding more layers and creating some designs as well. So far I am pleased and wonder why I had not thought of using old books before. Cut a length of ribbon, use your head and the hair tie to measure. 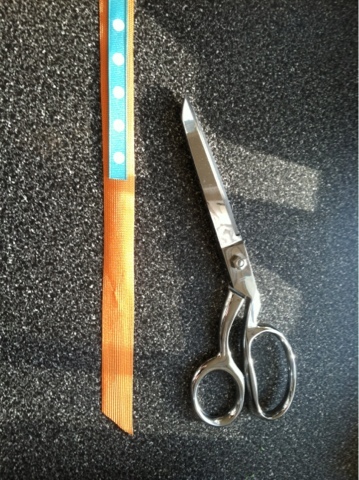 Cut the ribbon longer than necessary so you can trim excess. Fold and iron a loop of ribbon around the hair tie at one end. 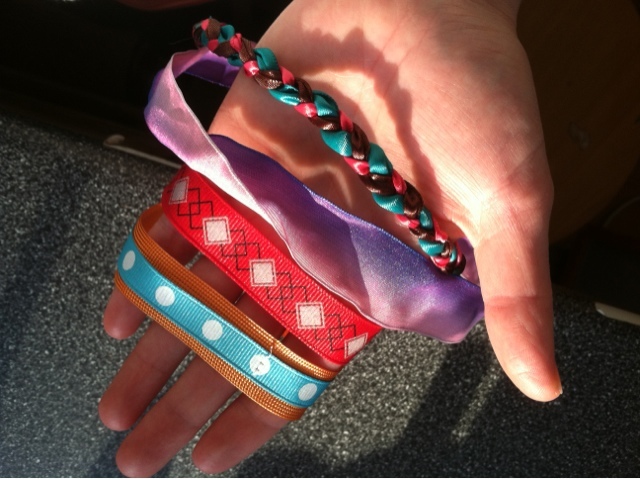 Sew and back stitch along the length of the hair tie. Measure one last time by safety pinning other end of ribbon around hair tie. Try the headband on and make adjustments as needed. 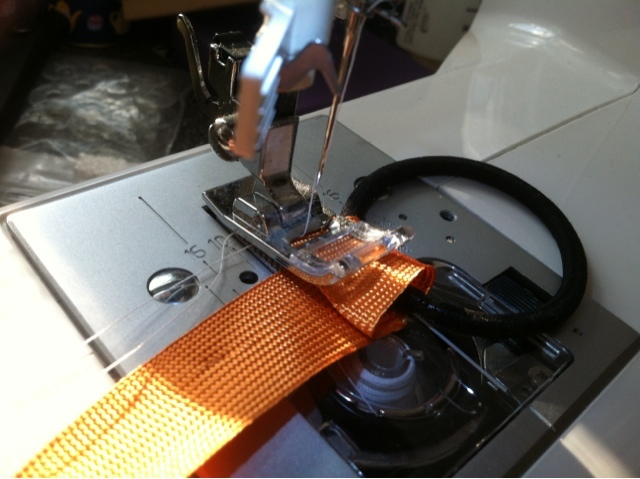 Sew along second loop, same as first. 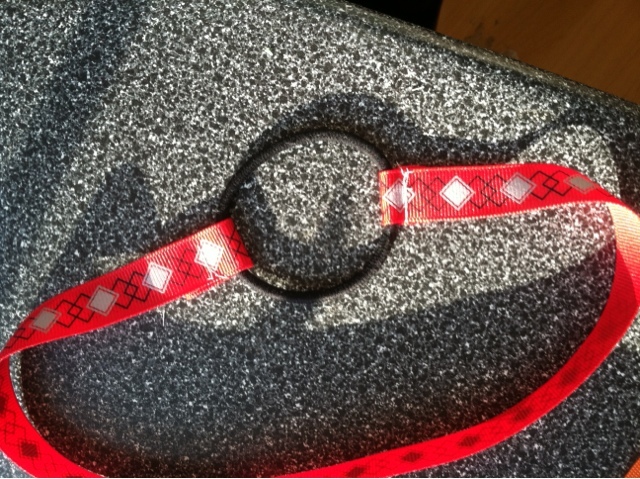 Variations of ribbon headband to try: braided ribbons, beaded ribbons, sewing a smaller ribbon on top of wider ribbon, adding embellishments of all kinds. 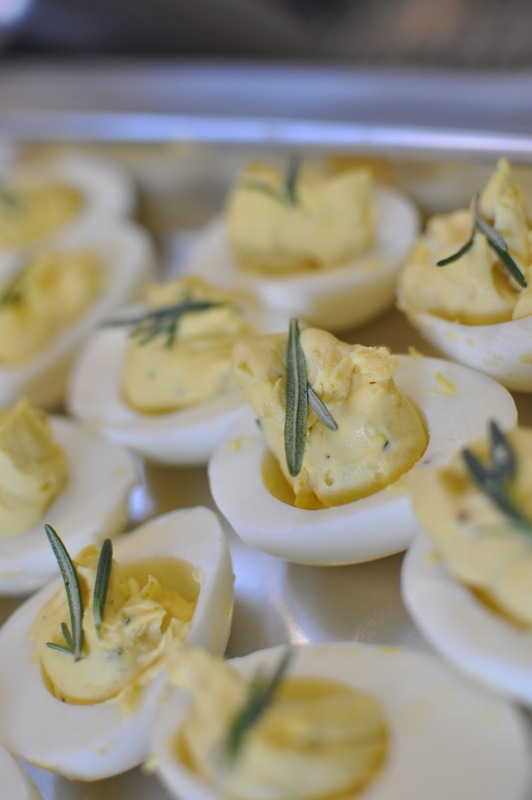 Last weekend I went to a baby shower and brought along these tasty snacks – deviled eggs. I always forget how much I love this finger food and how relatively easy they are to make. I am also astonished that some people buy them from the grocery store. They really just take some planning. Place 1 dozen eggs in a large sauce pan with cold water and 1 tablespoon of vinegar. The vinegar makes the peeling of the eggs a breeze. Put on stove top on high heat. When water reaches boiling, turn down to simmer and set timer for 10 minutes. After 10 minutes, pour off boiling water. Submerge eggs in ice water. 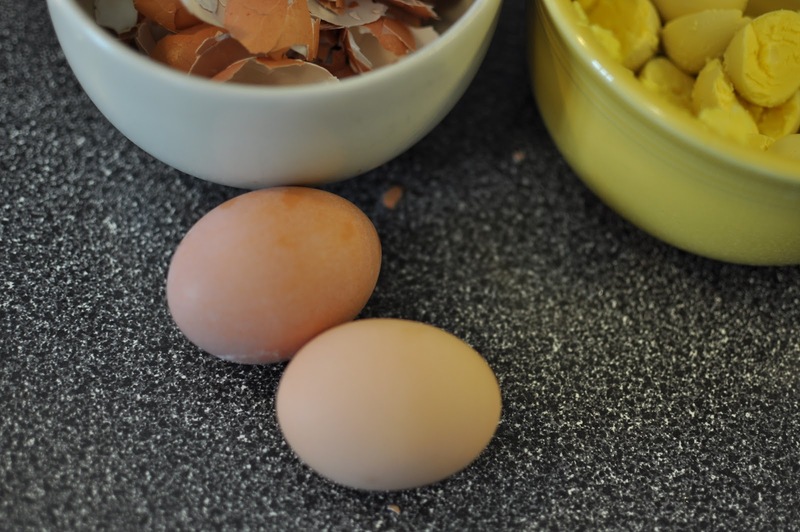 This prevents the yolks from turning a greenish color. When eggs are cool enough to handle, peel and slice in half. Pop yolks into a bowl or directly into a zip-loc bag. This is where it gets tricky – because my deviled eggs are different every time. 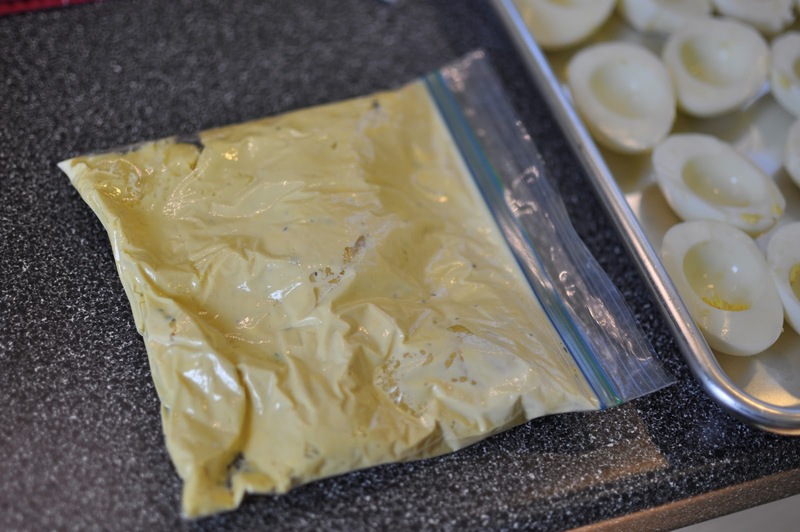 Add about 1/4 cup mayonnaise, 2-3 tablespoons mustard, 1-2 teaspoons vinegar, pepper and salt to yolk mixture. Chop fresh thyme and parsley, 1-2 tablespoons of each. Add to yolk mixture in bowl or bag. 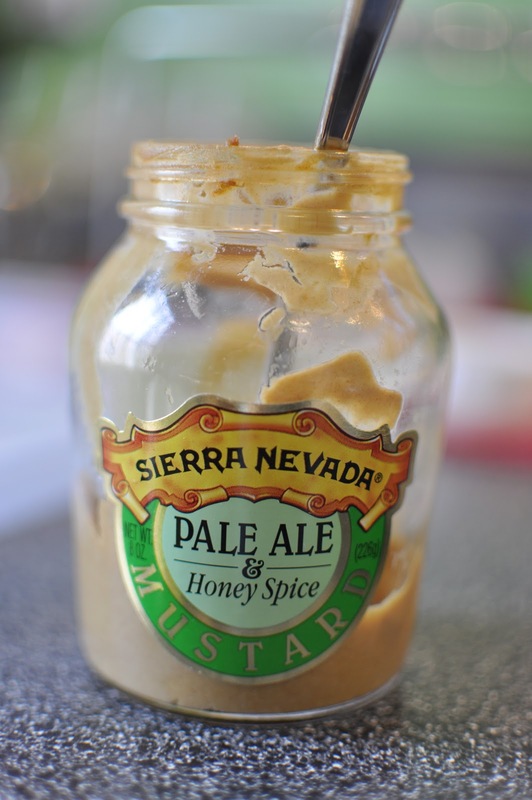 My favorite mustard comes from Sierra Nevada. They have delicious beer flavored mustards for a different twist. 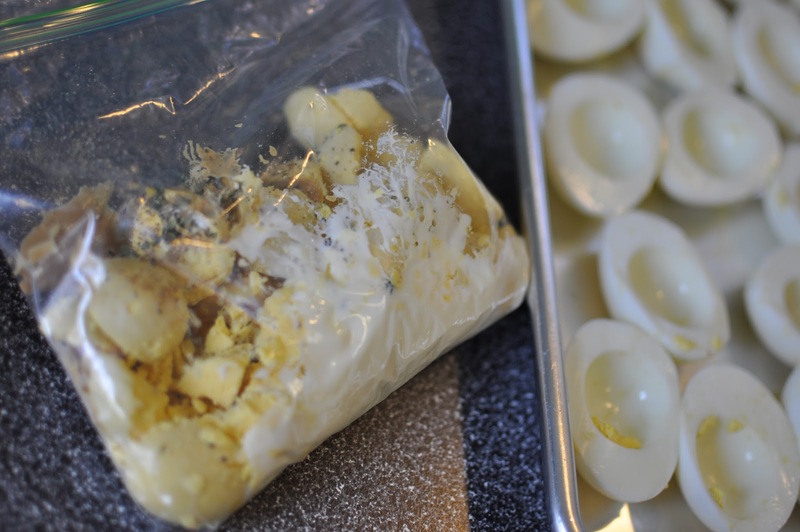 If you mix your yolk and mayo mixture in a zip-loc bag, carefully knead with your hands. This is where generic brand zip-loc bags can fail! Once the yolks are mixed smooth and creamy, you simply cut a small piece off of a corner and pipe the yolks back into the whites. Otherwise, mix in a bowl and spoon the yolk mixture into the halved whites. Sometimes you have more yolk than needed or sometimes you get lucky like I did this time and have just the right amount. I garnished my deviled eggs with fresh sprigs of rosemary straight out of my everything-grows-year-round North Carolina herb garden. Ok, so that is a real peek into how I cook: a dash of this and a dash of that, with recipes only serving as guidelines. Baking is precise, cooking is not.